This application note presents the procedure for efficient definition of analytical feed in the WIPL-D software suite. 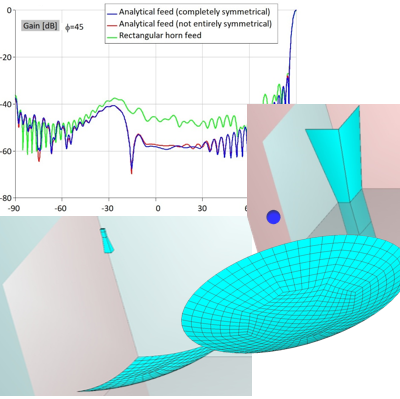 The defined feed further serves as an excitation of the electromagnetic (EM) problem. The feature used is Field Generators. The procedure is described on a reflector antenna example with radius and focal distance set to 10 wavelengths. For the efficient WIPL-D implementation of higher order basis functions and method of moments (MoM), such an example can be considered as electrically small. The simulation is practically instantaneous on any common laptop or desktop PC. In the particular design a requirement was to illuminate the reflector with a feed specified with radiation pattern having -12 dB radiation bandwidth exactly 106 degrees. There are two solutions for such a problem. One involves tuning a rectangular horn antenna, while the other is a simple definition of the analytical feed via the Field Generators feature. The application note shows exact equations which generate the analytical pattern according to predefined specifications. The reflector is simulated as illuminated with the traditional horn and two analytical feeds. The results indicate that the Field Generators can be used successfully to replace the actual illuminator. This is particularly important when the horn geometry is not known, or only the measured pattern is available. WIPL-D Field Generators allow the field to be generated either as radiation pattern file (in the WIPL-D format) or as analytical set of equations defining the field. In more complex scenarios, a pattern can be subsequently shifted or tilted, multiplied to form an array etc.